Is Your Organic Compost Really Sewage Sludge? Rosario Dawson poses with a sack of Kellogg Amend, a soil additive made from sewage sludgeLast May, a group of movie stars gathered at a schoolyard garden in Venice, California to raise money for the Environmental Media Association, a prominent Hollywood green group that supports organic gardens at public schools. 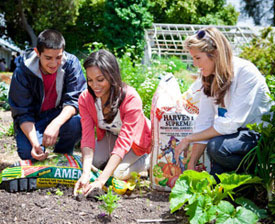 Among the publicity photos snapped that day was a product-placement shot of Rosario Dawson planting vegetables alongside a sack of Kellogg Amend, an “organic” soil supplement sold by Kellogg Garden Products, one of EMA’s corporate sponsors. “This was one of those unfortunate weird things,” says EMA president Debbie Levin, who hadn’t known anything about Amend before the shoot. Amend, she later learned, is not approved for organic farming because it’s made from municipal sewage sludge. Levin isn’t the only urban gardener who has gotten cozier than she might have liked with other people’s poo. The list of ingredients on Amend’s packaging avoids the terms “sewage sludge” and “biosolids” (the sewage industry’s preferred term) in favor of the more vague “compost.” But there’s no doubt that Kellogg’s “compost” comes from sludge, says John Stauber, a consultant for the Wisconsin-based Food Rights Network, who traced Amend’s origins to a Southern California sludge treatment plant. He equates the discovery to “finding out that the giant gorgeous Alpine mountain that you’ve been living next to is a heap of toxic waste.” (Kellogg Garden Products did not return a call from Mother Jones). Poop may be the least of the problems with biosolids; sludge’s dirty secret is that it can contain anything that goes down the drain—from Prozac flushed down toilets to motor oil hosed from factory floors. A 2009 EPA survey of sludge samples from across the US found nearly universal contamination by 10 flame retardants and 12 pharmaceuticals and exceptionally high levels of endocrine disruptors such as triclosan, an ingredient in antibacterial soap that scientists believe is killing amphibians. Large food processors such as H.J. Heinz won’t allow crops grown with sludge in any of their products. For more on sludge’s safety issues, check out the 2009 Mother Jones story, Sludge Happens. Stauber, who who first exposed the hyping of sludge in the 1995 book Toxic Sludge is Good For You!, sees Amend and similar products as examples of greenwashing gone wild. The USDA doesn’t regulate which fertilizers can be labeled as “organic,” allowing anyone to use the term (though it bans the use of sludge in organic agriculture). And the nonprofit U.S. Composting Council sees no problem in using its green image for the Orwellian rebranding of sludge. Biosolids companies sit on its board of directors and are sponsoring its upcoming Composting Week.